Van Hoisington and Lacy Hunt have figured out what few others have, that excessive debt and falling asset prices have conspired to render the best efforts of the Fed impotent. Please consider the Hoisington Second Quarter 2009 Outlook. One of the more common beliefs about the operation of the U.S. economy is that a massive increase in the Fed’s balance sheet will automatically lead to a quick and substantial rise in inflation. [However] An inflationary surge of this type must work either through the banking system or through non-bank institutions that act like banks which are often called “shadow banks”. The process toward inflation in both cases is a necessary increasing cycle of borrowing and lending. As of today, that private market mechanism has been acting as a brake on the normal functioning of the monetary engine. For example, total commercial bank loans have declined over the past 1, 3, 6, and 9 month intervals. Also, recent readings on bank credit plus commercial paper have registered record rates of decline. The FDIC has closed a record 52 banks thus far this year, and numerous other banks are on life support. The “shadow banks” are in even worse shape. Over 300 mortgage entities have failed, and Fannie Mae and Freddie Mac are in federal receivership. Foreclosures and delinquencies on mortgages are continuing to rise, indicating that the banks and their non-bank competitors face additional pressures to re-trench, not expand. Thus far in this unusual business cycle, excessive debt and falling asset prices have conspired to render the best efforts of the Fed impotent. 3) The AS or supply curve must be upward sloping. The economy and price changes are moving downward because none of these conditions are currently being met; nor, in our judgment, are they likely to be met in the foreseeable future. Note that lower velocity does not cause anything to happen. Lower velocity is a result of increasing demand for money (i.e. a reluctance by consumers to borrow, and banks to lend). Reluctance to lend can easily be seen in a chart of bank reserves. 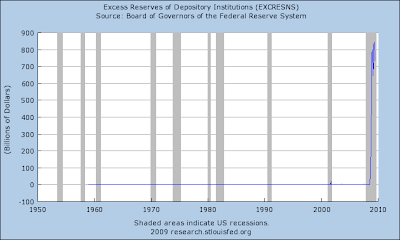 With reserves rising the following chart should not be so surprising. 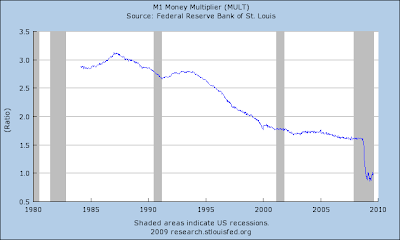 The M1 multiplier is the ratio of M1 to the St. Louis Adjusted Monetary Base. Please see Money Multipliers, Velocity, and Excess Reserves for more on these phenomena. Conventional wisdom regarding money supply suggests there is massive pent up inflation in the works as a result of the buildup of those reserves. The rationale is that 10 times those excess reserves (via fractional reserve lending) will soon be working its way into the economy causing huge price spikes, a collapse in the US dollar, and possibly even hyperinflation. However, conventional wisdom regarding the money multiplier is wrong. Australian economist Steve Keen notes that in a debt based society, expansion of credit comes first and reserves come later. Indeed, this is easy to conceptualize: Banks lent more than they should have, and those loans are going bad at a phenomenal rate. In response, the Fed has engaged in a huge swap-o-rama party with various banks (swapping treasuries for collateral of dubious value) in addition to turning on the printing presses. This was done so that banks would remain "well capitalized". The reality is those excess reserves are a mirage. Banks need those reserves for credit losses coming down the pike, as unemployment rises, foreclosures mount, and credit card defaults soar. Banks are not well capitalized, they are insolvent, unwilling and unable to lend. If you have not yet done so, please read Global Debt Bubble, Causes and Solutions with a reference to a very interesting video by Keen. Inquiring minds may also consider my theory on credit and debt as presented in Fiat World Mathematical Model. Steve Keen's thinking helped me finalize that model. Total U.S. debt as a percent of GDP surged to 375% in the first quarter, a new post 1870 record, and well above the 360% average for 2008. Therefore, the economy became more leveraged even as the recession progressed. An over-leveraged economy is one prone to deflation and stagnant growth. This is evident in the path the Japanese took after their stock and real estate bubbles began to implode in 1989. 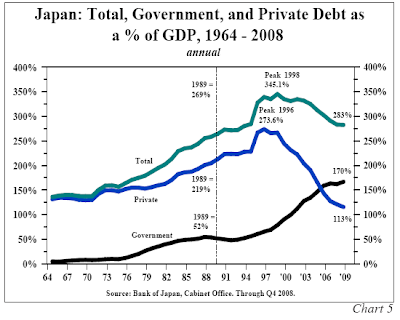 At that time Japanese debt as a percent of GDP was 269% (Chart 5). debt repayment became more burdensome. In several years, real GDP may be no higher than its current levels. However, since the population will continue to grow, per capita GDP will decline; thus, the standard of living will diminish as unemployment rises. These conditions will produce a deflationary environment similar to the Japanese condition. Presently the 10-year yield in Japan stands at 1.3%. Ultimately, our yield level may be similar to that of the Japanese. Hoisington's observations are something I have mentioned on numerous occasions. In regards to treasuries, I agree with Hoisington that long-dated treasuries are attractive at this level. However, I do entertain the idea, and have done so ever since the December, that the bottom in yields may be in. For more discussion, please see U.S. Treasuries Yields - Where To From Here? Clearly stocks are a better buy now than in 2007 or 2008. But that does not mean stocks are cheap. Indeed, by any realistic measure of earnings, stocks are decidedly not cheap. Then again, 6-month treasury yields are yielding a paltry .31%. Can equities easily beat that? Yes they might, but that does not mean they will! Fundamentally, the S&P 500 can easily fall to 500 or below, a massive crash from this point. Alternatively, stocks might languish for years. The Japanese Stock Market is about 25% of what it was close to 20 years ago! Yes, I know, the US is not Japan, that deflation can't happen here, etc, etc. Of course deflation did happen here, so the question now is how long it lasts. Even if it does not last long, there are no guarantees the stock market stages a significant recovery. A friend, "BC" sent the following comments in regards to chart 5 (shown above) from the Hoisington article. See chart 5 illustrating the conditions persisting during Japan's slow-motion, deflationary, debt-deleveraging depression from the mid-to-late '90s when the Japanese Boomer demographic drag and persistent price deflation took hold. I strongly suspect that we will experience a similar pattern between private and public debt/GDP. We could see bank lending/GDP return to the 30% long-term average area from today's peak of 50-51% (and bank real estate loans/GDP of 27% vs. the long-term average 10-11%). Instead of "recovery" or "expansion", we should think in terms of a Schumpeterian Depression phase of the Long Wave trough, characterized as a debt-deflationary, deleveraging, demographics-induced no-growth regime. Long-term 3.3% real GDP growth has decelerated to ~1.5%, and I expect average growth from the '00 peak to the mid- to late '10s to decelerate further to 1% or below. The bottom line is that private debt-based growth is simply not possible, whereas any "growth" we do experience will be as a result of incremental government borrowing and spending, most of which will be in the form of war spending, bailouts, and social service transfers at very low GDP multiplier. There is much more in the article for those interested in history or book references. This blog, Calculated Risk, Minyanville's News and Views, Big Picture, Naked Capitalism, Zero Hedge, Market Ticker, Life After The Oil Crash, The Oil Drum, Financial Sense, Patrick, Piggington, and numerous other widely read sites are all part of the Creative Destruction process. High quality content is now available for free. In many instances it's far better than what you can pay for. The five month, 50% rebound in the S&P 500 was certainly spectacular. However, the more important question is where to from here? Take a look at Japan's "Two Lost Decades" for clues. Creative destruction in conjunction with global wage arbitrage, changing demographics, downsizing boomers fearing retirement, changing social attitudes towards debt in every economic age group, and massive debt leverage is an extremely powerful set of forces. Bear in mind, that set of forces will not play out over days, weeks, or months. A Schumpeterian Depression will take years, perhaps even decades to play out. Thus, deflation is an ongoing process, not a point in time event that can be staved off by massive interventions and Orwellian Proclamations "We Saved The World". Bernanke and the Fed do not understand these concepts, nor does anyone else chanting that pending hyperinflation or massive inflation is coming right around the corner, nor do those who think new stock market is off to new highs. In other words, almost everyone is oblivious to the true state of affairs.